The Gonds are one of the largest indigenous peoples of India and are spread throughout several states of central India. Gond paintings were initially executed only on the walls of dwellings as an expression of religious beliefs, a record of daily life and local festivals, and to depict the surrounding environment and creatures. Gond artwork is characterised by the use of natural symbols such as trees and animals, with meanings rooted in animistic folktales and the culture of the Gond people. Venkat Raman Singh Shyam is the nephew of Jangarh Singh Shyam (1962–2001), one of the first indigenous Indian artists to gain international recognition when his work was included in the seminal 1989 exhibition 'Magiciens de la Terre'. 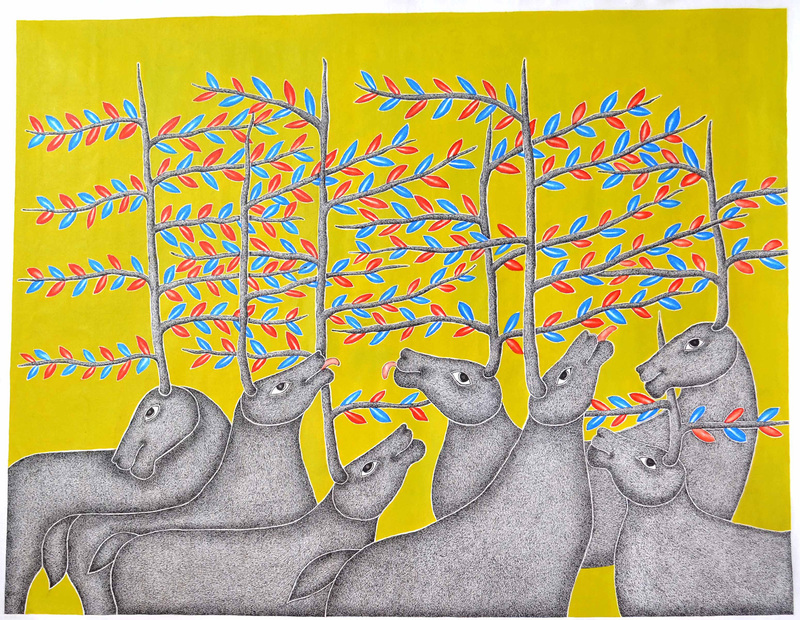 Venkat Shyam began painting at the age of 10, and draws from Gond myth, oral history and nature, as well as depicting scenes of modern city life and his own personal experience. Venkat Raman Singh Shyam has also worked with the QAGOMA Children's Art Centre to develop a project for APT8 Kids.